Christmas Ornaments Made in USA - 2010 Secret Service Holiday Ornament - A Christmas Ornament Co. 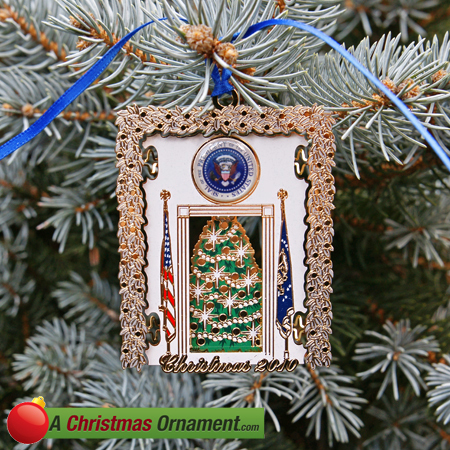 The 2010 Secret Service holiday ornament depicts the annual Christmas Tree that is placed in the Blue Room of the White House. Above the doorway is the official Seal of the President. To the right of the Blue Room there is an image of the President's flag while the American Flag is on the left. Each year the First Lady selects the official White House Christmas Tree and it arrives on a traditional horse drawn carriage to the North Portico. Every year contestants apply for this honor. Last year's tree was a 18-1/2 foot Douglas Fir from Shepherdstown, West Virginia.